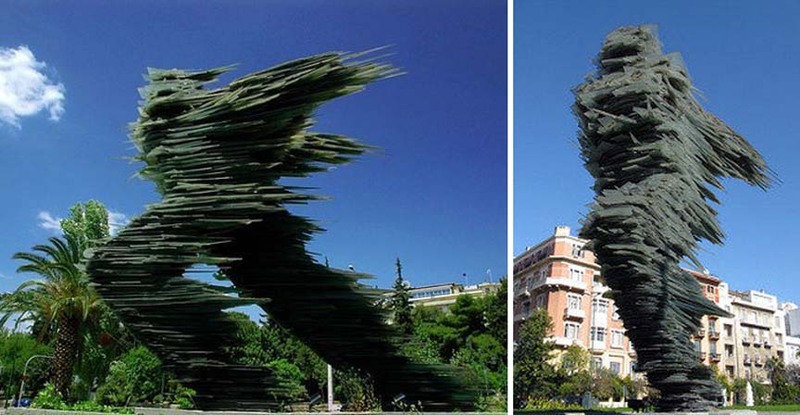 This sculpture is called Dromeas or Runner by Costas Varotsos. He started it in 1988 and finished in 1994. It was erected at Omonia Square in Athens, Greece, not Georgia. Georgia USA, not Europe. Anyway, they felt compelled to move it to Megalis tou Genous Sholi square when subway construction began under the first location. That seemed wise considering it’s 12 meters high and glass. It’s a fitting sculpture within a city with so much running history—Athens was, after all, the final destination of Pheidippides’s famous run from the Battle of Marathon. But unfortunately, the artwork wasn’t met with unanimous appeal. Though some heralded the innovative sculpture, others were less-than-pleased with its unusual appearance. How the heck do you do blurry in a sculpture? I wonder if he sand blasted the edges so there's no shiny surfaces or sharp corners/edges to photograph clearly. Took him 6 years to figure it out. Looks like stacked plate glass. Yes it is. I think there's a steel support in the middle but what is seen is stacked sheet glass.